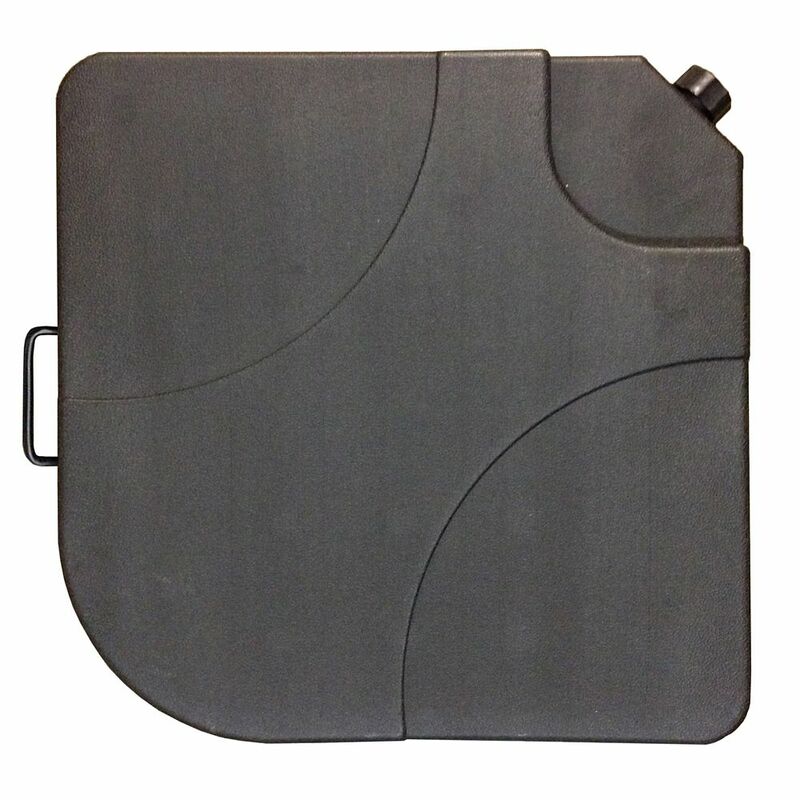 Support your CorLiving deluxe patio umbrella with the PPU-902-U umbrella base weights. Constructed of durable plastic and made to withstand the elements of the outdoors. Designed and recommended to fill with 15L of water to add the additional weight equal to four pavers/stones creating a sturdy supportive base for your umbrella. Support your CorLiving patio umbrella with the PPU-901-U umbrella base. Constructed of durable plastic and made to withstand the elements of the outdoors. Designed and recommended to fill with 22L of water or sand to add the additional weight needed to create a sturdy supportive base for your market umbrella. 35 lb. Resin Cross-Arm Umbrella Base Weights in Ebony (4-Pack) Sleek, yet rugged, ebony-colored resin base gives you a professional look for your cross-arm stand umbrella at an affordable price. These (4) 35-lb square-shaped base weights conveniently sit inside the arms of the cross base firmly securing your umbrella in position while you relax in comfort and enjoy the shade of your outdoor surroundings. No need to buy separate heavy paver blocks. Simply fill each of the four (4) sections of this base with sand or water for a total weight of up to 140-lbs. 35 lb. Resin Cross-Arm Umbrella Base Weights in Ebony (4-Pack) is rated 4.6 out of 5 by 10. Rated 4 out of 5 by RY from These worked out well for the umbrella we bought. Just some tips on these. If filling with sand, ... These worked out well for the umbrella we bought. Just some tips on these. If filling with sand, make sure the sand is dry. If wet and clumpy, it will be difficult to fill. If filling with water, there are no washers installed in the caps causing water to leak from the caps. Purchase some 1-1/4" OD rubber washers (Everbilt C7202C) that can be bought from Home Depot and install them in the caps. This should prevent most of the water leakage from the caps. Rated 5 out of 5 by Kevin from Fit perfectly on the umbrella base. The area where we... Fit perfectly on the umbrella base. The area where we placed umbrella is a bit uneven, so we added some extra weight to make it more stable anyway. Rated 5 out of 5 by Krich from The product performs as expected. They were easy to fill with sand; I like the attached carrying... The product performs as expected. They were easy to fill with sand; I like the attached carrying handle. They fit perfectly on the stand and look much better than the sand bags I used previously. Rated 5 out of 5 by LB from We liked the weights, but the umbrella we bought did... We liked the weights, but the umbrella we bought did not provide enough shade, we returned it, therefore weights not needed. Rated 5 out of 5 by Alexander from Only filled with water - so lighter than sand -... Only filled with water - so lighter than sand - still did a great job - even with the umbrella open and in windy conditions - very stable - and easy to move!